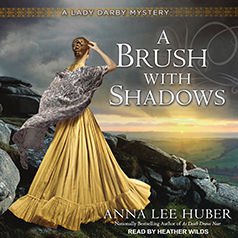 Anna Lee Huber presents the sixth book in the Lady Darby Mystery series. All is not well at Langstone Manor. Gage's grandfather, the Viscount Tavistock, is gravely ill, and Gage's cousin Alfred has suddenly vanished. He wandered out into the moors and never returned. The Viscount is convinced someone or something other than the natural hazards of the moors is to blame for Alfred's disappearance. And when Alfred's brother Rory goes missing, Kiera and Gage must concede he may be right. Now, they must face the ghosts of Gage's past, discover the truth behind the local superstitions, and see beyond the tricks being played by their very own eyes to expose what has happened to Gage's family before the moors claim yet another victim . . .